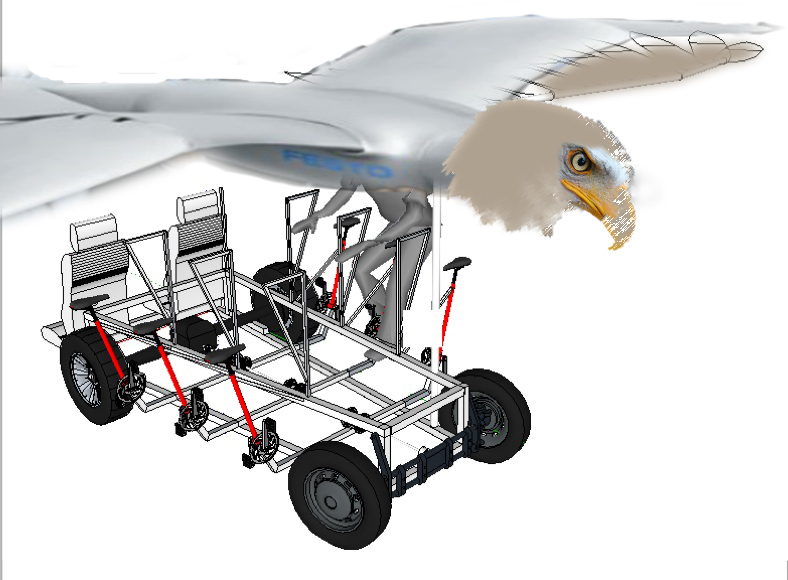 · The ShamanCycle is equal parts dynamic art sculpture and multi-person bicycle, a visionary green vehicle with a beautiful and massive Eagle as the roof! Something like this has never been created before. 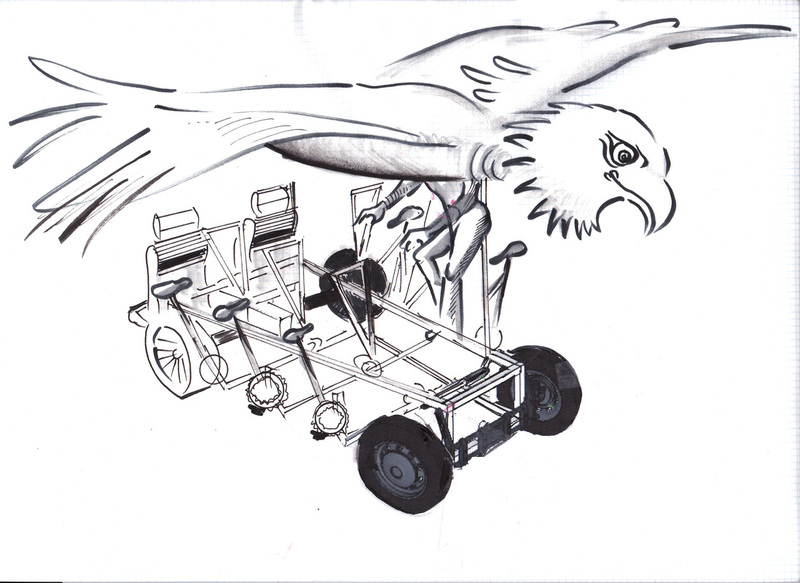 Six people power the ShamanCycle via peddling, 1 person steers, and the steering mechanism is integrated with the massive eagle structure on top, so when the bike turns the head and wings move in perfect unison! The ShamanCycle is made from reclaimed and repurposed metal parts, imagineered by artist Phoebe Legere and engineered by a rocket scientist (seriously). The ShamanCycle will have a pedal powered generator to make it a truly off the grid mode of transportation. Oh, and fireballs shoot out of it's eyes, because that is awesome. Why is there an Eagle on top? 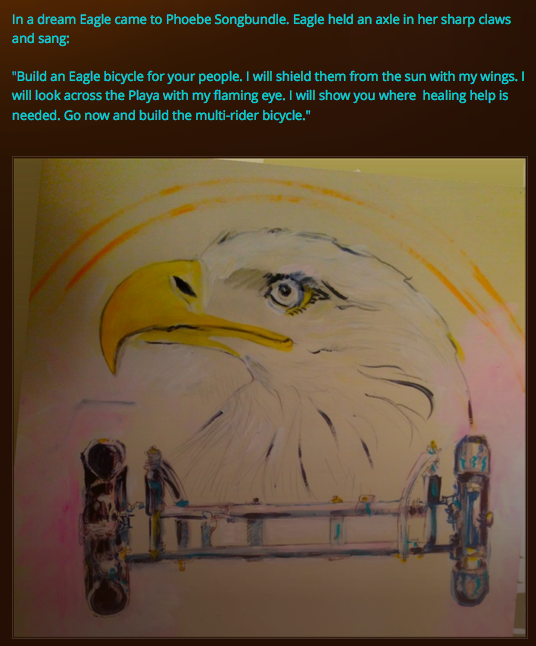 · Eagle medicine is incredibly powerful, and represents vision, courage, and the unification of heaven and earth. Eagle flies higher than any other bird, affording it tremendous perspective, yet it can soar down to the Earth in an instant. Eagle is an apex predator! Eagle can teach us about the interdependence of Nature, and about our ability to reach new heights.... while staying grounded and connected to the Earth and each other! Eagle affords us the vision and perspective to see how all things relate, and the courage to honor and respect all of these relations. Calling all Burners and Cool People everywhere! Please DONATE! It's art! It's renewable, sustainable human energy, it's pedal power, it's a symbol of who we are and what we stand for...and it's got bucket seats! Team Leaders Phoebe and Jeff . Why are you building the ShamanCylce? · It is our collective prayer for a more beautiful, peaceful, and loving planet, a symbol of the kind of world we are calling into existence. A world where beautiful art can be co-created, sustainable, inspiring, cutting edge, healthy, functional, and fun, all while building community. What does the ShamanCycle represent? · The ShamanCycle represents the healing power of big art, sustainability, shamanism, a deep commitement to the environment, a willingness to learn from animals. It is a symbol of our love. We celebrate teamwork and collaboration, we honor the partnership between artists and engineers, between activists and designers, and the coming together of loving human beings. 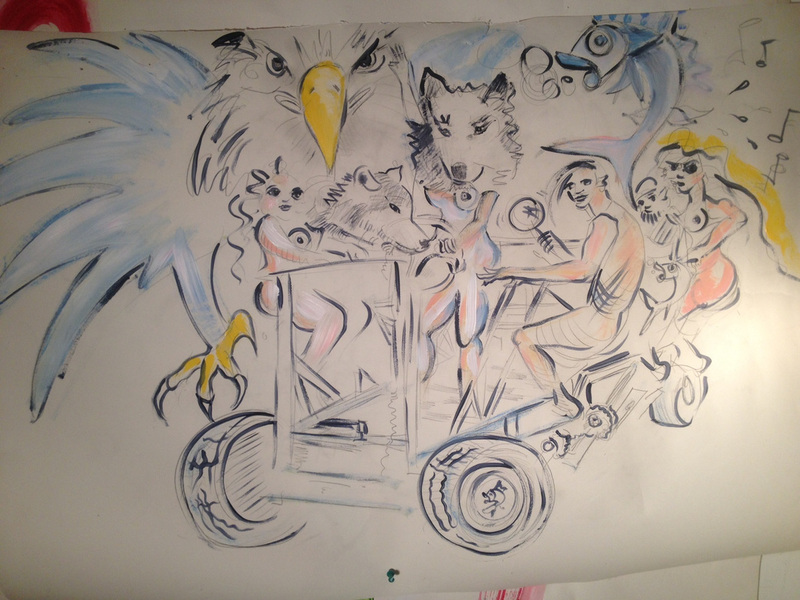 Early drawing of Shamancycle vision by Phoebe Legere showing Power Animals and Shamandome campers riding together on a Green, Human Powered Vehicle. Can I ride the ShamanCycle? Where? · Yes! At Burning Man 2013. During the day, the ShamanCycle will be parked out front of ShamanDome, part of Honeysuckle Village, and at night we will glide over the landscape, listening to the spontaneous call for healing, ceremony, and celebration. And if you donate enough money (and live in CA), perhaps you can pick up your kid from school in the Shamancycle. 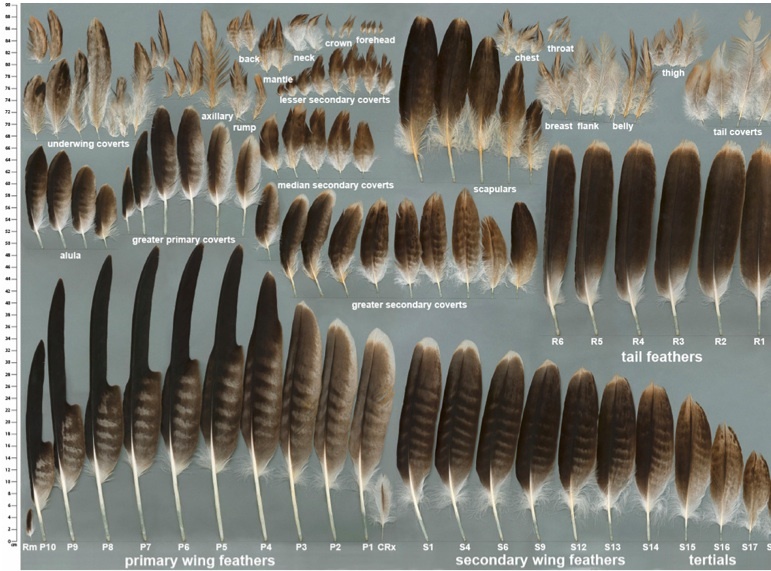 We have 12 feathers of different sizes, built from careful mathematical and scientific analysis of the miraculous powers of Eagle flight. Each feather will be incised with the name of a DONOR. Want YOUR name on a DONOR feather? Please DONATE now! · Shamanism is powerful spiritual technology that is your ancestral birthright. All ancient human cultures have a Shamanic aspect in their tradition and all open-minded/open-hearted humans can directly benefit from Shamanism. Shaman's are messengers between the spirit world and the material world. Before written language and civilization, information was conveyed through song, dance, and movements, often learned from close observation of Nature and all of her animals. This close observation and embodiment of Nature led to direct knowledge of medicine, healing, ways to communicate with the spirit world. This Radio Controlled Toy version of the ShamanCycle is a reward to our donors in the Winged Victory Sky Patrol Circle ($500 dollars and above) !!!! 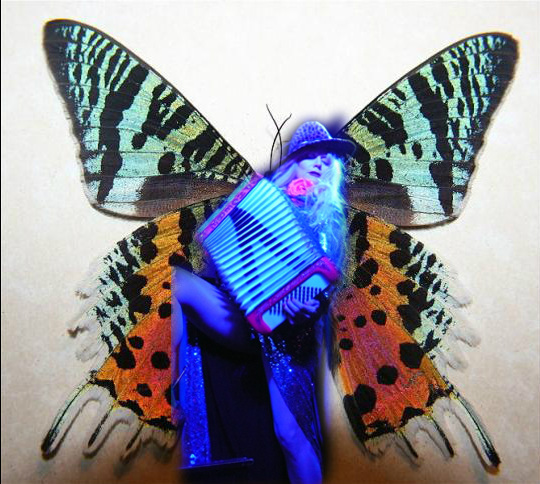 · Shamandome is a diverse collective of shamans, shamanistas, and healers who offer various Shamanic workshops, rituals, and ceremonies for the Burning Man community. 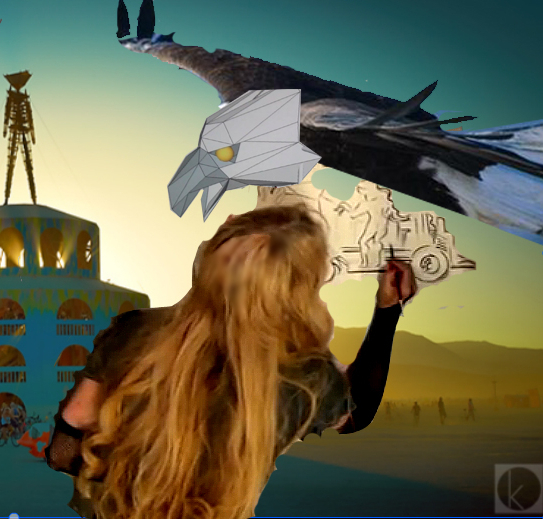 · Yes, its true, Burning Man is that arts festival that is infamous for being the wildest party on the planet, but it is so much more than that too! It is a temporary community built on a unique set of cultural norms and attitudes (including radical self-expression, and the avoidance of monetary transactions). It is civilization 2.0, and it is more vivid, beautiful, and powerful than you anyone can possibly imagine. So stop imagining and join us! 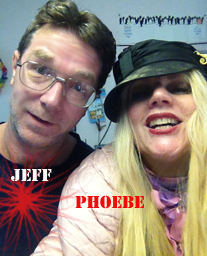 Who is Phoebe "Songbundle" Legere? Phoebe is a transmedia artist. She creates works that combine music, dance, visual art, sculpture and renewable energy technology. What is "The Medicine Power of Big Art" ? · We pay homage to the ability of beautiful art to heal, to teach, and to guide us in our ability to live, love, and be of service. The ShamanCycle will most certainly have a very healthy life of service beyond the Burning Man arts festival, and will soar towards wherever her special medicine is needed most. Please "LOVE" us on Facebook! Love is your Power! 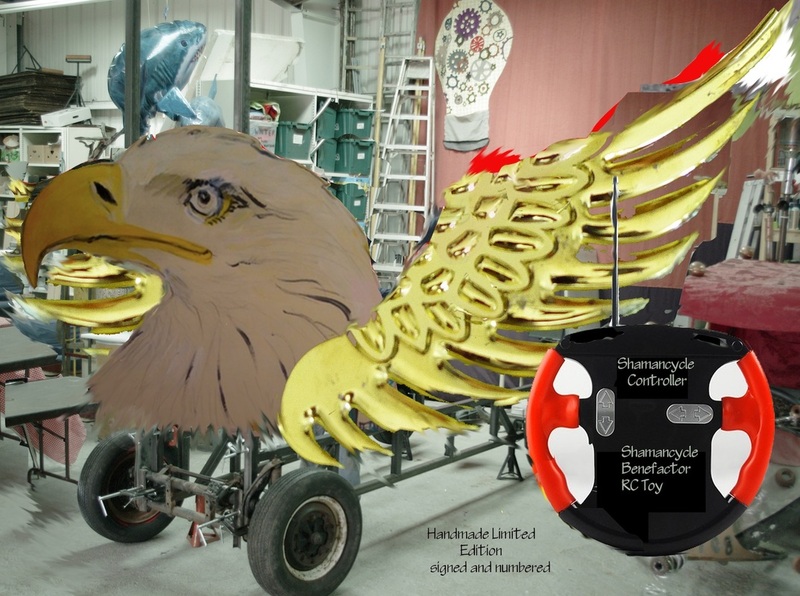 ~ The Shamancycle will be a monumental, leg-powered Eagle puppet with Flaming Eyes, Moving Wings, and Claw Fenders. 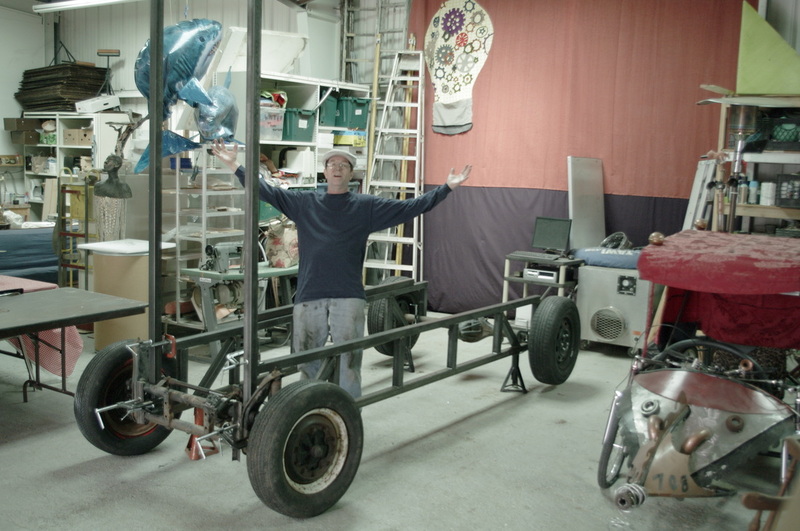 ~ Shamancycle is a large-scale community mobile art bicycle. ~ Shamancycle is a monument to the reality of the Imagination and the medicine power of big art. ~ Shamancycle is a visionary Green Vehicle. Please donate! Join Team Shamancycle! We want to build a better, greener, cleaner, cooler world.